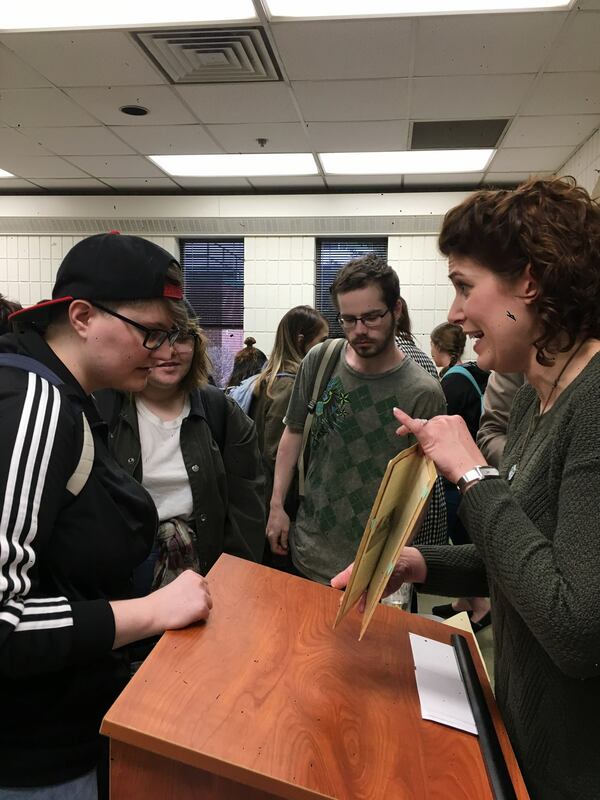 The original research event presented by Women’s and Gender Studies and the Department of History on Thursday, March 21st was a wonderful success for both departments. History M.A. student Mandy Shaver discussed her exciting research into West Virginia women during the Civil War, as well as her experiences moving from the Undergraduate program to the Graduate program here at Marshall. While 42 attendees were recorded on a sign-in sheet, this did not include a number of History Department professors who attended the event, as well as a handful of students who arrived after the presentation began. Attendance was so great that the event had to be moved to a larger room to accommodate everyone. Mrs. Shaver paused at different points throughout her presentation to take questions from the group, some of which concerned her particular research while others were focused on the differences between Graduate and Undergraduate programs. The many questions asked were thoughtful and reflected the audiences’ attention to Mrs. Shaver’s presentation. Thanks to Dr. Laura Michelle Diener, this event was widely advertised within the History and Women’s Studies Departments, and both the Graduate Director, Dr. Bob Deal, and the Phi Alpha Theta faculty advisor, Dr. Dan Holbrook, sent emails advertising the event, as well. Refreshments in the form of pizza, cookies, and punch also helped to draw in students who may have had to skip their lunch to attend. The success of this event was highly encouraging for both departments, and they look forward to working together in the future on similar projects which highlight the original research of Marshall students and allow those who are new to academia to gain insight from more experienced scholars. Amanda Shaver is a native of Huntington, WV, and received her Bachelor’s degree in history from Marshall University in 2018. She is now an M.A. History student and Graduate Assistant, and her studies focus primarily on the 19th century U.S., the Civil War, and women’s history. Amanda currently serves as treasurer for the history honors society Phi Alpha Theta, and she is the 2019 recipient of the Rosanna A. Blake and Fred E. Hulse Scholarship in Confederate History and the Dr. Robert F. Maddox Thesis Research Award for her working thesis on West Virginia women in the Civil War. After graduation, Amanda plans to enter the field of public history, bridging the gap between academia and the general public. The Graduate College is now accepting applications for the summer tuition benefit. The application can be found here: Tuition Benefit form. The deadline is Monday, April 29. Students must be enrolled in a degree-seeking program and have a graduate grade point average of 3.5 or higher. Students receiving tuition benefits from any other source, including GA positions, are not eligible for this benefit. Programs ineligible for this benefit include Social Work, Pharmacy, Physical Therapy, Public Health, and Management Practice in Nurse Anesthesia (DMPNA). Students classified as Distance Learners are not eligible for this benefit. Students may receive the benefit once a year. Faculty/staff members in a degree-seeking program may receive the benefit up to three times a year. President Gilbert, in making the announcement, said the new designation, considered a significant milestone in the academic research world, is a tribute to the hard work and research efforts of faculty across the institution.